Behold & Reflect: The Swede in me: "Fika: The Art of the Swedish Coffee Break"
The Swede in me: "Fika: The Art of the Swedish Coffee Break"
Fond childhood memories and my affinity for all things Swedish drew me to author Anna Bronnes' and illustrator Johanna Kindvall's Fika: The Art of the Swedish Coffee Break, an illustrated guide to the Scandinavian tradition of taking a mid-morning and/or mid-afternoon break to sip a restorative beverage and nibble tasty treats. While most Americans see coffee as fuel to speed through their day, Anna Bronnes explains that her coffee-loving homeland sees it as a reminder to pause, savor and converse with friends. Some readers might be surprised to find a modern cookbook without full-color photographs with every recipe. In fact, there are no photos in this book. Instead, Kindvall's fresh, minimalist artwork perfectly includes just enough detail to illuminate techniques and equipment while giving the book an airy, uncluttered feel in tune with the idea of simplifying and slowing down.As for text, the book is divided into five sections, walking Fika-novices through historical and contemporary fika culture, sweet treats for summer fika and holiday fika, and savory fika fare. Each section begins with several pages of explanation and insight. I found Bronne's analysis of the Swedish love-affair with foods from afar-- namely, coffee, chocolate and exotic spices like cardamom, ginger and cinnamon-- especially interesting. Often, when a cookbook author advocates for homemade, unprocessed and organic, they also champion locally sourced ingredients. But Swedes have happily absorbed many exotic ingredients as foundational flavors in their national cuisine. As someone who values both environmentalism and multi-culturalism, it's a contradiction I'm happy to live with. I was also inspired by the idea of getting out the fancy china and making ordinary moments special, even if that means packing the indoor spread for enjoying outdoors. And, of course, the 150-page hardcover contains plenty of from-scratch recipes for traditional and contemporary Swedish pastries, breads and sandwiches, all of which had me daydreaming of how I might start a fika tradition in my own home. Notable recipes include: vetebullar (cinnamon and cardamom buns), syltgrottor (jam thumbprint cookies), kladkaka (sticky chocolate cake), rabarbersaft (rhubarb cordial), mjuka pepparkakor (soft ginger cookies) and pannkakor (Swedish pancakes). For those who enjoy Swedish cookies and are curious about Swedish culture, I highly recommend this book. 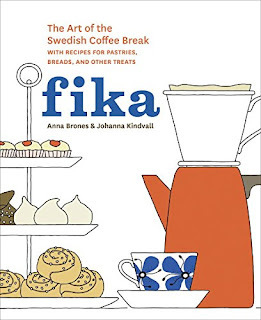 Or, even if you haven't given much thought about Swedish coffee break, but would like a reason to slow down and savor the little things in life, Fika is a fun excuse to help you do just that.